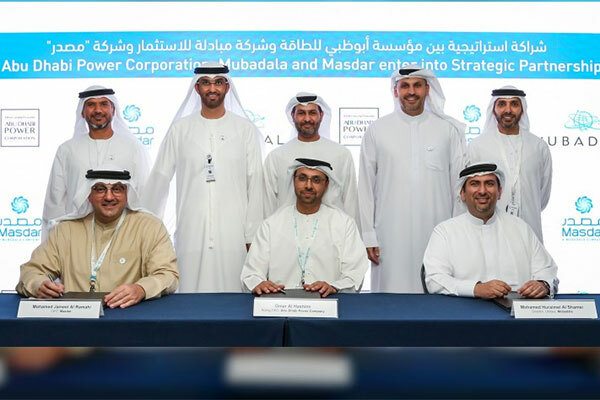 Abu Dhabi Power Corporation (ADPC) has entered into a strategic partnership with Mubadala Investment Company and Abu Dhabi Future Energy Company, Masdar, during a signing ceremony held at Abu Dhabi Sustainability Week 2019. The strategic partnership supports the UAE’s efforts to grow the power and water sector, while supporting Abu Dhabi’s long-term sustainable development objectives, reported Emirates news agency Wam. Mubadala’s contribution as an experienced investor in utilities illustrates its support to the future development of power and water generation in Abu Dhabi. The partnership follows the directives of Sheikh Mansour bin Zayed Al Nahyan, Deputy Prime Minister, Minister of Presidential Affairs, and chairman of the Supreme Committee for Abu Dhabi’s Water and Electricity Sector, which held its meeting recently at the Presidential Palace in Abu Dhabi. The strategic partnership includes key projects related to water desalination with a production capacity of over 400 million gallons per day, and renewable energy over 5 GW of electricity in the form of solar and over 2GW of conventional power generation over the next five years. The projects are expected to commence tendering during the first half of 2019 by the Emirates Water and Electricity Company (EWEC), a subsidiary of Abu Dhabi Power Corporation. Mubadala and Masdar have existing capabilities and expertise in the energy sector. They have numerous local and international assets and facilities in power generation: more than 8 GW in conventional electricity generation and over 4 GW in renewable energy. Masdar’s presence in renewable energy spans more than 25 countries. Commenting on the new partnership, Dr. Sultan bin Ahmad Sultan Al Jaber, Minister of State and chairman of Masdar, said, "Masdar is pleased to enter into this strategic partnership with Abu Dhabi Power Corporation to help realise the next phase in the development of Abu Dhabi’s power and water sector, including its continued adoption of commercially viable renewable energy. "This agreement is aimed at leveraging the latest technology and innovation for the efficient delivery of Abu Dhabi’s energy needs. Combining the experience and expertise in conventional power and water solutions of Mubadala with Masdar’s leadership in renewable energy and clean technologies illustrates our shared commitment to the continued modernization of a cost-efficient, technologically-advanced and environmentally-sustainable power and water sector for the benefit of the people of Abu Dhabi." Saif Alhajeri, chairman of Abu Dhabi Power, said, "Abu Dhabi Power Corporation aims to support Abu Dhabi’s pioneering status in the energy sector and its key developmental pillars for a more advanced and sustainable future. The strategic partnership with Mubadala and Masdar will notably support these efforts by benefiting from their wealth of local and international experience and bringing many key sustainable projects to fruition." He added, "Through the continual support and guidance of the UAE’s wise leadership, we will continue to identify areas of development that can effectively drive future growth and sustainability." For his part, Awaidha Al Marar, chairman of the Department of Energy, said, "The agreement is an important step towards strengthening the sustainability of traditional and renewable resources and is a testament to the agility of the energy sector in Abu Dhabi and its ability to adapt in line with the vision and strategy of our wise leadership." "The agreement will help introduce the business community in the UAE and abroad to the wide range of investment opportunities that the sector presents through increased reliance on new technology, efficiency optimisation and the utilisation of scientific research to diversify energy resources." Al Marar added, "The unification of efforts by three leading sector companies is a reflection of integration steps, and we look forward to executing the agreement to achieve desired outcomes through energy security for future generations." Khaled Al Qubaisi, CEO of Aerospace, Renewables and ICT at Mubadala, said, "With the UAE’s efforts to ensure the sustainable use of its resources and to diversify its economy, it is critical to ensure that key infrastructure is in place to meet the demands of the Emirates now and in the future. Our strategic partnership with Abu Dhabi Power will see us leverage our existing capabilities in delivering major domestic and international utilities projects. “In doing so, we can make a difference to a sustainable future through efficient, cost effective and world-class power and water services. Our gratitude goes to the Government for continuing to support innovations that enhance the quality of life for the community and we look forward to working with our partners to realize an ambitious shared vision."